I remember the olden days when DC’s were based on 10 instead of eight… let’s fix that! You are a master magician. The DC for all your spell’s is now 10+ proficiency + your spell casting ability modifier. Basics-Hard to starboard for an airship battle! 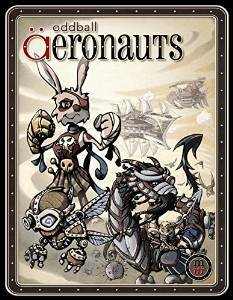 In Oddball Aeronauts, each player takes the role of one of two airship captains trying to destroy the others ship. Each player starts with a deck of cards that is specifically created for each ship. There are two types of cards in the deck: events and characters. Events are one time occurrences that will randomly change the flow of the game as they are drawn to the top of the deck. Characters have two major sections to them: statistics and tricks. The statistics are broken down into three distinct areas: sailing, guns, and boards with a major skill number and a skill bonus (more on this in a bit). The trick on each character is another ability the card might be able to add to a fight. Players set up after shuffling their decks by taking three cards and placing them face-down in their hands. Next, players then place the remaining cards from their deck face-up in their hands. Players will then look at the top three cards in their hands. The first card’s skill has to be used in the upcoming battle while one of the next two cards’ skill bonuses can be used and the trick from one of these cards can be used as well. However, the trick and the skill bonus can’t be from the next card. After looking over their three cards, each player starting with the lead (first player), announces how they will attack the other player via sailing, guns, or boarding, and the other player then announces how they will attack as well. Both players need not say the same method of attack. Then player will, after the count of three, announce how many of their top three cards they will use in the upcoming battle. The cards are compared with the highest skill + skill bonus from the second or third card + trick ability from the second or third card winning the hand. If the non-lead player won, then they become the lead. All players then discard the cards that were used in the battle by placing them face down in the deck under the other face down cards already in the players hand. Then, the method that the winning player used affects the decks. If the players won by sailing, two faces down cards are flipped into the face up part of that player’s deck making them available cards now. If the player won via guns, then the losing player discards face down two additional cards under their deck. If the player won via boarding, then the winner gains one card to their deck, and the loser loses one card. Play continues like this until one player has only face down cards in their hand and their air ship has crash! How about some fun for DnD 5e? Haven’t done that in a while, but I think it’s time to do a fighter build. Let’s make one that hunts magic users! You hate magic. You’ve studied long and hard to make those who use it pay. Be it the evil wizards who may have enslaved your family, the vile cleric who sacrificed your parents, or the capricious warlock who seduced your lover-you hate all who use the art. Now, you’ve honed your weapons, more specifically your hammers, to deal with those who cast spells. You’ve suffered, and now they’re going to pay! At 3rd level, you’ve mastered the art of distraction. When you are engaged with any spell casting creature and they cast a spell, you can spend a reaction to force them to make a Constitution saving throw with the DC equal to 8 + your proficiency bonus + your strength or dexterity modifier. If they fail, they lose the spell. At 7th level, you have mastered the art of spell resistance. You gain advantage on all saving throws against spells cast against you. You can choose when this effect is applied, and if you want to make a saving throw at all if you are aware of the spell. At 10th level, when you strike a foe with a hammer or hammer-like weapon that does bludgeoning damage and the foe tries to cast a spell, they gain disadvantage on the Constitution saving throw from your Magic Dissonance class feature. At 15th level, if you succeed at a saving throw and the spell would still affect you even if you succeed, you are now no longer affected by the spell at all. If you fail a saving throw against a spell and the spell has an effect on a success, you are only effected by the effect of the spell as if you had succeed on the spell saving throw. Starting at 18th level, you no longer have to spend a reaction to use your Magic Dissonance class feature. Let’s keep the hits rolling! This time for the technomancers out there who just can’t take the hit from the net! You’re as otaku as they come. You ride the matrix faster than any decker could hope too. But when you do that vodoo that you do, it hits you harder than it should. When you use any complex form, increase the fading value by the amount of levels you have in this power. Basics– There is a lot more magic than what you see on the trids, chummer. 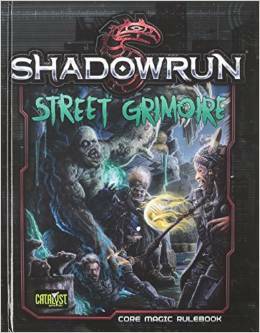 Street Grimoire is a large hardcover book covering magic in the Shadowrun 5e world. The book spends a long time discussing how magic works (or how it might work), the world and magic, different types of magic, and other canon pieces of Shadowrun before diving into adding hard, crunchy bits to the setting. It covers all types of magic from mages to adepts and everybody in between like spirits with each type of magic (spell casting, enchanting, summoning, et al) getting their own chapter. Some people get hit harder then others when they do some physical tasks. Maybe that would carry over to magic as well? You can run a mile in under 7 minutes, you can bench press 200 and not break a sweat, but when you cast a single spell it hits you like a ton a bricks. Increase the drain value for every spell you cast by the number of levels you have in this quality. This does not change the type of drain from stun to physical.